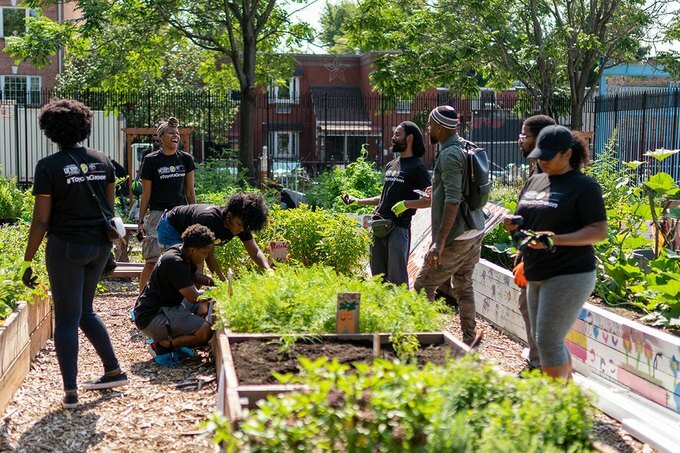 After years of neglect and abuse, locals and community volunteers of Goodwin Place have come together and transformed a derelict Bushwick park space into the Good Life Garden. Located at 50 Goodwin Place, a quiet street a block away from Broadway, Good Life Garden is a 13,000-square-foot public garden open April to December that offers arts, culture, and education programming and addresses the socioeconomic needs of the community. Spearheaded by Good Life Garden Executive Director Kofi Thomas, the former derelict park was reclaimed, cleaned up, and cleared out in October 2017. The space is now organized and maintained by a group of 10 neighbors. They work as stewards of the land: sharing their knowledge of gardening, and healthy, sustainable living with seniors and youth alike. 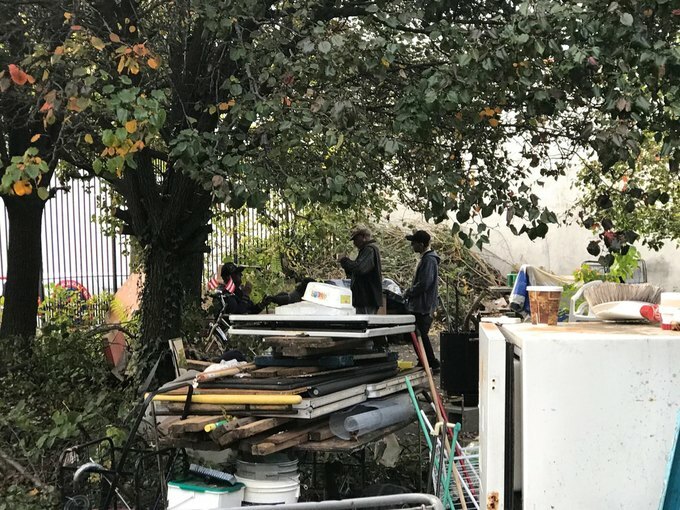 The cleanup efforts have led to a transformation of the block and neighborhood, forging new community bonds in a place that had been dark and unwelcoming for years. “We want to have this garden change the culture, both inside it and around. 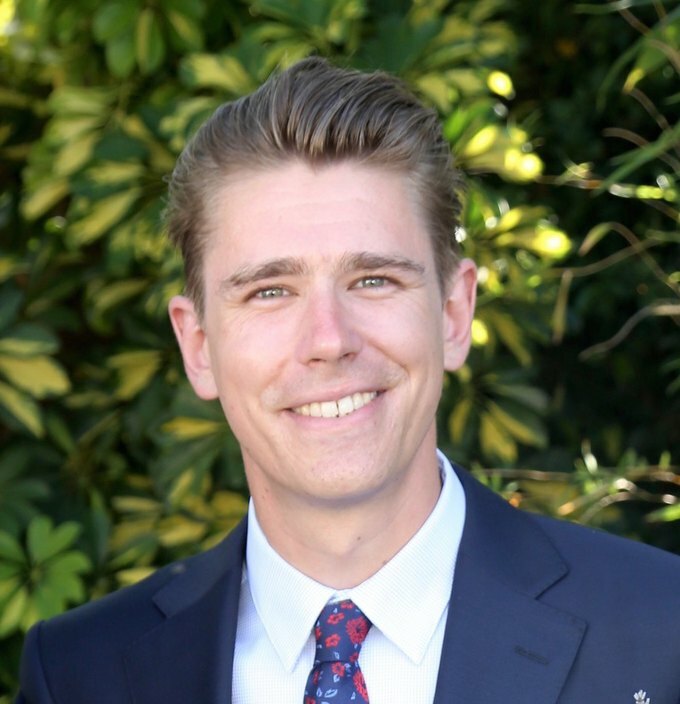 We want people to feel different about their street and to start taking care of it, to start planning, to give this space back to the people who it affects every day,” Thomas said. Once a park built by the New York City Department of Parks and Recreation in the 1990s to serve residents of the adjacent senior center, the park slowly slipped into disuse over the years. Broken bottles, shards of glass and drug paraphernalia littered the ground. Homeless took up residence, often passed out cold from drug and alcohol abuse. The park’s slow decay was further exacerbated in 2012 when two trees were knocked over during Hurricane Sandy. With the city stretched for resources after the devastating storm, cleanup efforts never came, and the trees became covered with trash. 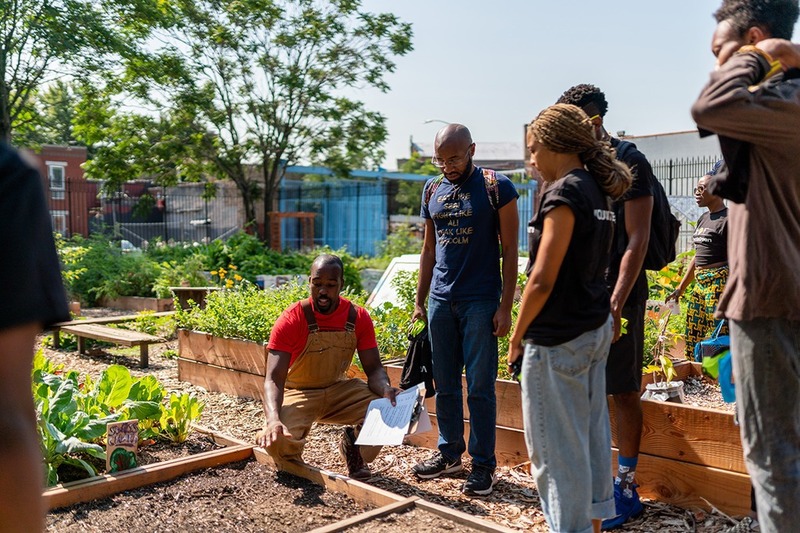 Thomas, a neighborhood resident living on Greene Avenue just around the corner, had heard about the space through other community gardening activists and had his curiosity piqued. Nobody in the neighborhood seemed to know the story behind the abandoned lot, or even if it was open to the public. “For a neighborhood where every square inch is so valuable, how could this be forgotten for so long? Who is responsible for taking care of this?” Thomas said. 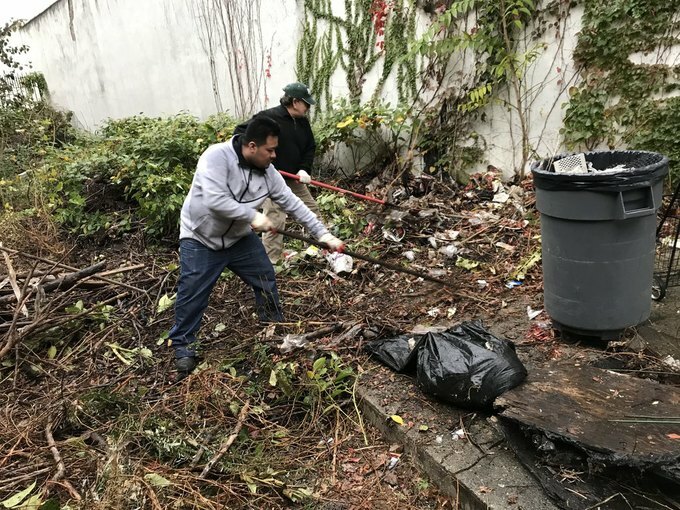 With encouragement from neighborhood elders, rejuvenation efforts began in October 2017 when Thomas and two other local community gardening activists decided to take matters into their own hands, showing up with rakes, shovels, and trash bags in hand, taking on the massive mess one day at a time. “In a very Brooklyn way, we decided to just go in there and start doing it until someone said stop,” Thomas said. The volunteers removed hundreds of pounds of trash and debris over the weeks, tediously picking up shards of glass by hand. The homeless that had abused the abandoned park for years eventually cleared out. “You could see the impact of cleaning up that space and putting positive energy in, without me having to tell anybody to stop harassing women there. They all just left. It started to change the safety of the street,” Thomas said. After taking the initiative with cleanup efforts, Thomas then met with Parks Department officials and the representatives from Goodwin Place Operations, the senior center adjacent to the park, to discuss and address what they would like to see happen with the rejuvenated space. Within a day of posting a sign-up sheet for seniors who wanted to garden, more than a dozen names were listed. With the involvement and help of organizations like the Brooklyn Queens Land Trust and GrowNYC, planter boxes were rebuilt, with design intention as an urban learning garden accessible to all. Healthy living is promoted through growth of fresh organic produce like tomatoes, basil, squash, peppers, cucumbers, carrots, collard greens, potatoes, pumpkins, corn, and beans. Gardeners of all ages and backgrounds mingle and manage the colorful raised garden beds. Good Life Garden also hosts events that serve the local senior center, women’s shelter, and schools through meal giveaways, art projects, concerts, festivals, family reunions, voter registration, and advocacy meetings for tenants rights and immigrants rights. Funding is critical for gardening supplies like fertilizer, seeds, hoses, lumber, paint, and other tools, and comes from donations, with the garden’s stewards cumulatively spending thousands of dollars out of their own pockets. 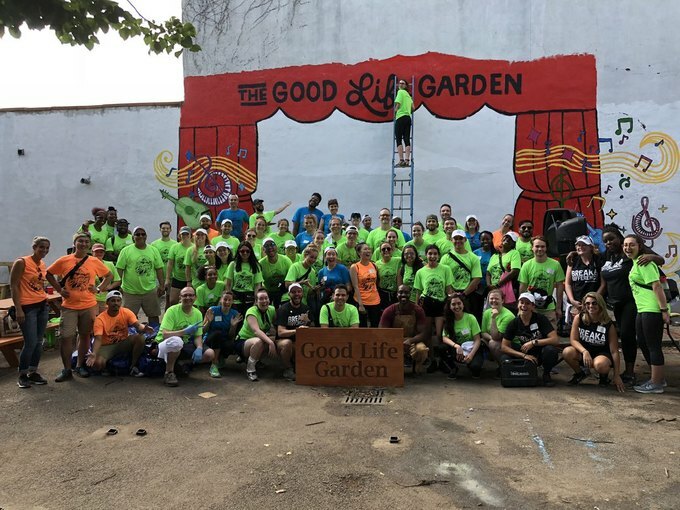 Good Life Garden’s GoFundMe page is live to raise funds to facilitate further repairs, support additional programming and keep the garden open more hours of the week during the growing season. The garden welcomes volunteers of all backgrounds and skill sets who want to get involved. To volunteer one can email goodlifegardenbk@gmail.com. Cover photo and other photography courtesy of The Good Life Garden.